Happy Home Baking: What's your reason? I believe there is always a reason behind an action. Even a no reason is a reason itself. There is always a reason (and sometimes several reasons) why I choose to bake something...be it cakes, cookies or just a simple loaf of bread. Sometimes my reasons could be quite frivolousness (^^'). I could have bought a new set of muffin cups or some new ingredients that I die die must try. Most of the time it was purely due to inspirations from images I saw on cookbooks or food blogs. Occasionally, I would conduct some kitchen experiments mainly to try to clear whatever ingredients that was nearing shelf life. So, what's the reason(s) behind these soft and fluffy cinnamon rolls? 2) I have wanted to try making bread using this 65C tang zhong (water-roux) method ever since I saw it at MH's blog...2 years ago. (MH if you are reading this, I just want to tell you I finally bought a digital scale, there is no more excuse for not being able to measure 84g of tang zhong!). 3)A few weeks ago, a reader by the name of Cupcake asked me which brand of cinnamon powder do I use. I am sorry I did not reply her question. I wasn't able to. Other than the Chinese five spice powder, I have not bought any cinnamon powder. I have not baked anything with cinnamon powder, even if a recipe calls for it, I will omit it. The reason is, I am really not sure whether my family will like it. However, Cupcake's comment was so 'powerful' that I found myself dropping a bottle of McCormick's cinnamon powder into my shopping basket when I went grocery shopping the other day. So, cinnamon rolls, here I come! 4) This last reason is not the everyday kind of reason. Actually, this is the highlight of this blog post! On our flight back from Beijing last December, I watched this Japanese movie, Seagull Diner or Kamome Shokudo かもめ食堂，海鸥食堂 on board. I didn't get to finish watching the last half an hour of the movie as the entertainment system was switched off to prepare for landing. This movie left such a good impression that I have to watched it when I came back. I did a search and was so happy to able to watch it online! Some sites provide Chinese sub, some are in English. I recommended it to my cyber-friend VB, thinking that she would probably like this kind of movie...especially she is currently learning Japanese. Now, I can't write a movie review at all. I can only say it is a very beautiful movie. It will leave you with a very good feeling after watching it. The story is extremely simple...about a Japanese woman, Sachie, who opens a diner in Finland, and her encounters with two other Japanese women and her Finnish customers. Do hop over to the above link to read about the story. I really enjoyed the movie and so did VB. Since the setting is a diner, you cannot run away from Food! There are 3 particular scenes I love...a man who came to the diner to teach Sachie how to make a good cup of coffee; Sachie and her friends making those big, fat, pure white onigiri; and Sachie making Cinnamon Rolls and the Finnish ladies having them for tea. I am so inspired that I told myself I must really make it a point to try it. I am really glad that I finally did it! Hop over here to watch the preview of this movie to decide whether you will like it! I did not make the classic type of cinnamon rolls where the dough is made with plain flour...which will give a more chewy texture. I prefer something softer, so I followed this cinnamon roll recipe from this book, 65度C汤种面包 (65degC Tang Zhong Bread). Anyway, to cut the story short, I was rewarded with a tray of sweet smelling cinnamon rolls 4 hrs later. How I wish you could 'smell' these rolls off your screen! I skipped the icing/glaze as the roll already tasted so good on its own. It was an instant hit among my two boys. We have it for tea, breakfast and tea again the next day! The recipe is a keeper, and I am sure I will be making this again and again and again. So, what's your reason for baking something? Place 25g bread flour in a saucepan. Add 125ml water, mix till smooth, making sure there are no lumps of flour. Cook over medium to low heat, stirring constantly with a hand whisk to prevent it from burning. Within 1 to 2 mins, the mixture will start to thicken, stop when you see traces in the mixture for every stir you make with the hand whisk. (Take a look at the video clip here. ) The 65degC tang zhong is ready. Immediately transfer the hot tang zhong into a bowl and cover it with a cling wrap, making sure the cling wrap sticks onto the surface of the mixture. This is to prevent a film from forming on the surface. Leave to cool completely before using it. Mix all the dry ingredients in a mixing bowl. Make a well in the centre and add in the egg, water and tang zhong. Mix to form a rough dough. Transfer dough to a lightly floured work surface. Knead the dough till smooth. This should take about 10mins. The dough is quite wet and sticky, it helps to have a dough scraper on hand to scape up the dough as your knead. Mix cinnamon powder and sugar together. Reserve about 1 teaspoon of the mixture. Remove the dough from the bowl and give a few light kneading to press out the gas in the dough. Roll the dough into a rectangle, about 30cm by 25cm, 1/2 inch thick. Brush surface with melted butter. Sprinkle the cinnamon/sugar mixture over the dough surface. Roll over the surface with a rolling pin, this is to make sure the fillings will stick onto the dough. Arrange the rolls cut-side up in a greased (or lined with parchment paper) 20cm square pan or any suitable baking tray. Leave some space in between the rolls to allow them to expand. Cover with damp cloth or cling wrap and leave doughs to proof for the second time for about 45mins, or until double in size. Brush top with egg wash (mix leftover egg with 1 tbs water) and sprinkle the reserved cinnamon sugar mixture over the top. Bake in pre-heated oven at 180 deg C for 15-20 mins or until golden brown. Remove from oven and once cool store immediately in an airtight container. Sweet, I'm going to try this method.. Half of the time my reason is "no reason" and i just want to use my mixer or the oven or try some new flavours. Love the golden baked look of the rolls. Hmmmm..... cinnamon! Hi, I'm just wondering if we can use breadmaker to make this type of tang zhong (water-roux) bread? Eating it with a cup of black coffee....its heaven! 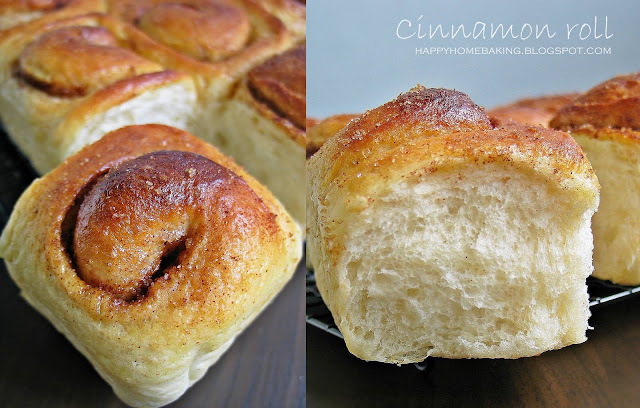 My reason for baking these wonderful rolls will be ..."becoz u tempted me"""
No other specific reason. lovely looking rolls.. wish i could try some from ur plate.. lovely clicks too. I made some garlic rolls this Saturday.. If I had seen this before I would have definitely made these. Ah Bii, you will first need to cook the tang zhong (water roux), the kneading of the dough can be done with the bread machine. You will still need to do the shaping and then bake with a normal oven. FL Mom, I have read from a bread making book about using dental floss to slice it, but my husband took the dental floss with him! ReeseKitchen, here's sending a roll over to you! I love cinnamon rolls and I just had cinnamon rolls yesterday. I only made this once but that was long time ago and I would like to try your recipe. Thanks for sharing! Ellerinize,emeğinize sağlık. Çok nefis ve leziz olmuş. I wish I could smell these off the screen too, cos they sure look incredible! Cinnarolls have been on my list too, but have just been procrastinating cos of the amount of (waiting) time required. But after your gorgeous pictures, now just HAVE to try! LOL. Whenever I travel, I'll look for cinnamon powder and vanilla essence, then test them in my baking. One particular brand my friend bought for me from the states is "durkee" brand. I have used it since 2002, ya, expired already, but the smell is still there;) Somehow, didn't find this kind of smell in other brands. haha.. tks for taking the time to answer my queries and test out the cinnamon powder! The vanilla essence you recommended is now in every phoon huat! Yeah! And it smells great! wor wor, 40mins of kneading by hand, these buns must be full of your love with it ^^..I wish I could grap one from the screen and immediate taste it, look super yummy..will check the Japanese movie later, Thanks for sharing. Thanks Happy homebaker! I am sooo going to try this weekend after i master the tuna buns from your previous post :) thanks for sharing another great recipe of yours. Hey i m\must say great blog!!! I enjoyed reading it and so, i am awarding you the Blog of the day award. I'll do this on thursday evening!! As I got a food thermometer for my birthday, the fact is's called 65°water roux means that the roux is ready when the temperature reaches 65 I suppose, should I check this to avoid burning the roux? I love cinnamon roll´s!!! They look so delicious! Thanks for sharing this wonderful recipe! Heehee, most of the time the reason for me to bake is to eat~! But glad that you have so many good reasons. ;) Another classic bake...can see how soft and fluffy it is. yum! Wow. Cinnamon rolls! I love those. I actually love cinnamon in all. like cinnamonhoney tea, cinnamon raiain bread, etc. Your posts are getting better and better! the messages that comes with it. Keep it up! They look delicious, I need to try this recipe! I 've had a look round and this is a lovely blog, plenty of detail and advice well done! cake decorating is an art! Anncco, looking forward to seeing your cinnamon rolls, I am sure you can come up with something way better! Grace, yes, I will like to try out other breads using tang zhong method. Jess, I will be posting another recipe, that one will be easier to knead! NEL, yes, bread making takes a long time! It is only good for people like me who stays at home the whole day! Cupcake, thanks for the info! If I have the chance to go to the States, I will help you look for this brand. dotz, I read your post, what a coincident! tammy, warning, if you are kneading it by hand, this is a wet and sticky dough. I hope you have a standing mixer to do the job for you. Apest, yes, stop cooking when the water roux reaches 65degC, stirring constantly all the time. Bee Bee, yes, we bake to eat! Wonderful looking cinnamon rolls. I better get started on mine too! LOLz. My reasons for baking are quite straightforward. 1) inspired by the photography or the uniqueness of recipes found in books or online. btw you cinnamon rolls look awesome. sure to tempt cinnamon lovers and non-lovers alike. The instructions are meticulous and well-written. good job for the effort! The cinnamonroll looks great! Does this require bread machine? My reason for baking is simply to use my oven! I like to bake with cinnamon, can't resist the aroma while baking with cinnamon. Unfortunately my family (particularly my mom)doesn't quite like it. So I usually halve the amount of cinnamon used in the recipe. I must hide from my mom that I actually used cinnamon in my bake else she will refuse to eat. haha. Ur cinnamon rolls look perfect, very fluffy and you shaped them very nicely. I also baked some kaya rolls recently, mine the shape is not uniform :( Will share in my next post. Baking Fiend, same here, I thought my younger child won't like cinnamon, so I used the minimum amount required. Cook.Bake.Love, my younger child tasted it and commented it smells like the apple pie from Mcdonalds ;) He doesn't like apple pies at all, because of the cinnamon. Can't wait to see your kaya rolls! I made some red bean buns (boring hor?! ), will need to find time to blog about it. No special reasons to bake, besides out of curiosity!! Hahaha. To "Wai Sek" oredi, jsut want to taste everything. Added another tsp of cinnamon and another tsp of sugar. The smell of cinnamon rolls baking is heavenly, used to make them all the time for my children when they were small, I wonder why I stopped. Going to have to change that, and bake up some cinnamon rolls, like the idea of a lighter pastry, not so heavy, therefore not so high in the calories. Thanks for the recipe to try. HHB, thanks for sharing this heart-warming movie. I believe i will like it as much as you do. I have book-marked it. Will watch it when free. Can imagine the aroma of cinnamon from your buns. Indeed looks soft and nice. All the best for your boy upcoming exams too. Jia You! Hey, your cinnabons look better than mine! You made pull-apart type ... I thought of that ... But then, I shook the idea off too ... LOL! Yup, the rolls are good even without the glaze! Tangzhong method is good, right? Baking is actually my "quiet" time, time and space for mummy to do her own thing and not be bothered (hence why sometimes I bake at midnight!) but seeing the kids' (& hubby's) faces light up when you have a freshly baked cake/biscuits/slice on the cooling rack is such a joy. Wouldn't trade baking for buying processed foods any day. :P P.S: love the cinnamon buns! My reason is just simply loving to bake, and recently I think I love to cook too .. if only I do not need to coach kids, look after them and have all the time in the world! kneading by hand 40 mins? I really cannot do it ... so till now, dare not venture into bread yet, even thou has a breadmaker. Just too time consuming to wait for proofing. This roll looks so soft .. if only u sell your bakes. Pei Lin, please please watch this movie! You will like it!!! 非看不可,不看会后悔! Sherlyn, I still see cooking as a chore since it is a must to cook, while baking is a hobby. Hi HHB, your cinnamon rolls look great. I don't really like cinnamon but adding small amounts still acceptable. You have finally tried the Tang zhong method! You think it's possible to estimate the tangzhong's weight? I don't have a digital scale. Suhaina, thanks for sharing your garlic rolls, they look so delicious! HHB, cooking is still a chore, cos like you say it is a must to cook ... but on days when the time is not so pressing, cooking is more enjoyable lor, but the dreadful feeling of washing stay the same even if there are plenty of time. hahaha. Sherlyn, those people who don't know, they will think just washing some dirty dishes right? Washing means before, during preparations, plates, woks, pans, pots, etc; then cleaning up stoves, sink, then mopping the floor. After the meal, another round of washing, cleaning of sink, dinning table, etc. Then it is time for some fruits, another round of washing! Then keeping all the plates and bowls back into the cabinet. Never ending story leh! Hi HHB, I have just finished watching かもめ食堂，海鸥食堂. I want to thank you for recommending it because I really enjoy the movie.thank you again for sharing. yes, like you, I am inspired to make cinnamon rolls now !! Hi there, thanks for telling me :D I am glad to hear that you like the movie, I watched the movie the second time! That movie is very famous amongst bloggers! Anyway, the type of cinnamon rolls made in the movie is slightly different. I've tried Scandinavian cinnamon rolls (kanelbullar) before, they are dryer and less soft than the traditional American ones. They also use pearl sugar instead of frosting and have cardamom in the dough. Can I check with you? Which rack of the oven should I use for baking breads? Middle? Lowest? Hi Tan S H, I used the middle rack position. Did you over baked your bread? Hi HHB. Thanks for your reply! I found the dough very very sticky and hard to handle. Maybe cos I am also very green at baking breads. I used BM to knead (twice on dough cycle) and proof. Had a difficult time shaping after removing the proofed dough from the BM. Will try again though! :D Thanks again! Hi, oh so you have underbaked it. My oven temp is not stable, so I normally have to bake a few mins longer. My oven has only one set of heating coils on top, so I usually position my bakes in the middle or slightly more towards the top. I didnt have problem after the 1st proof, the dough wasnt that sticky to work with, I lined my table with the cling wrap (which I used to cover the bowl for proofing) and roll out the dough on it, this way, the dough won't stick. hi! if you can, check out peter reinhart's whole grain baking. there is a recipe in here for wholewheat cinnamon buns and it's still soft and fluffy like any white cinnamon bun! Hi Ivan, thanks for the info! I have actually copied Peter Reinhart's cinnamon roll recipe from his previous book, The Bread Baker's Apprentice. I have not read his latest book on whole grain baking though. I am very hesitate to try out his recipes as it seems so pro! May I ask if you have tried using this tang zhong method with the breadmaker? If you have do u mind posting it? I tired making a few times but failed, I ended up with very wet sticky dough at the end of the dough cycle. Hope you can help..
Hi, this is the first time I made bread with tang zhong, I have not tried it with my breadmachine as it broke down some time back. Maybe you don't add in all the water at one go (main dough), reserve some, as the dough kneads in the machine, you add a little at a time, so that the dough won't be so wet. Today I tried out this recipe and it was a great success. Though I am now having a tired hand (I kneaded the dough about 1 hour!!) but it worth the effort as everybody in my family love this soft and fluffy buns! Hi Wong, this dough is super sticky! I had to use Salonpas after making this bread :( I just learned that when making bread dough, it is not necessary to add the liquid all at once. Next time you were to make this, reserve some of the liquid, maybe around 30ml. Then add in a little at a time as you knead. This way the dough/flour is able to absorb the water slowly and at the same time it won't be so sticky. I made bread today too, my arms are so tired now! I love youuuuuuuuuuu, thank you so much, I awarded this my favorite bun so far :* I actually added grounded cardamom to the dough and it came out just great. I got 12 little buns in total and after only 30 minutes, 8 was gone mostly by my boyfriend, and I had to restrict him from eating more hahaha. Thanks for sharing this recipe. I have been using it a lot recently. Made many variations to it. I find that the tangzhong from the recipe too much for the dough and weigh out 85g exactly. Found that it worked great. Been doing multigrain and wheatgerm variations too. Thanks again. Is it possible if I omit the milk powder? Hi Lx, you may do so. Making these buns again for the third time in two weeks! Thanks again for the recipe. Just a quick question with the tang zhong...what happens if the tang zhong is under done or over done...can I still use it? I don't have a thermometer so usually guess when the roux is done but sometimes the consistency is really runny and then sometimes it firms up to jelly. Hi Chen, I do not have a thermometer too ;) the roux shouldnt be runny, if that's the case, heat it for a few more seconds. The mixture should be mayonnaise-like...soft paste-like. I am not sure how it will affect the texture, but I suspect if the roux is too runny, the dough will be very soft and sticky to knead. Thanks for the tips :-) I made another batch of these addictive buns and tried used nutella as filling... It tasted pretty good! My family really enjoy this recipe thanks to you! Can I make the water roux.dough in one big batch and keep them in fridge in qty as reqd in receipes? Use one portion when needed. Hi Eunice, the water roux can only be kept in the fridge for 1 to 2 days, discard when it turns grey. can i use both the tangzhong method and the sponge method in one recipe? i am just wondering if this can make the bread even ore softer and will remain soft for days.